The writer of the book of Hebrews lists “the laying on of hands” as one of the elementary teachings of the Messiah. What is the laying on of hands and what did it signify to the early believers? Listen to a rapid Bible study on the subject of semichah in the apostolic era. I’ll warn you right now that if you are a traditional Evangelical or Charismatic Christian, you aren’t going to like this. Typically, in Christianity, when we think of the “laying on of hands” we think that it’s for healing. We have examples in the New Testament (Matthew 19:13, Mark 10:13, 16, Luke 4:40) of Jesus healing by the laying on of hands. But this isn’t typically a Jewish practice as we understand the concept. While we find the laying on of hands or semichah in the Hebrew Scriptures (Tanakh or “Old Testament”), it’s isn’t for healing. From Lancaster’s perspective, the first type is what we see in the New Testament when we see a laying on of hands for healing. This, he believes, is a subset of laying on of hands for blessing, since isn’t healing a form of blessing? After all, Jacob blessed Ephraim and Manasseh by putting his hands on them (Genesis 48:13-14) and Jesus also blessed children by putting his hands on them (Matthew 19:13-15). Numbers 27:15-23 is the example Lancaster provides for the third type of laying on of hands, when Moses transfers his authority to Joshua, also conferring a portion of the Spirit that was upon Moses upon Joshua. Lancaster actually provided many more examples but I don’t want to simply transcribe his sermon onto my blog as I seem to do more often than not. But then he pulled the rug out from under his audience by saying that none of these examples apply to what we see in Hebrews 6:1-2, at least not exactly. Each of the prior “elementary principles” were very general in their application, but the examples from the Tanakh are all specific to certain people, roles, and situations. So what is the writer of the epistle to the Hebrews saying is so elemental about laying on of hands? The statement found approval with the whole congregation; and they chose Stephen, a man full of faith and of the Holy Spirit, and Philip, Prochorus, Nicanor, Timon, Parmenas and Nicolas, a proselyte from Antioch. And these they brought before the apostles; and after praying, they laid their hands on them. This was the commissioning of specific individuals within the congregation to act as Elders to serve the congregation as a whole. The act of laying on of hands also seems associated with the receiving of the Holy Spirit. 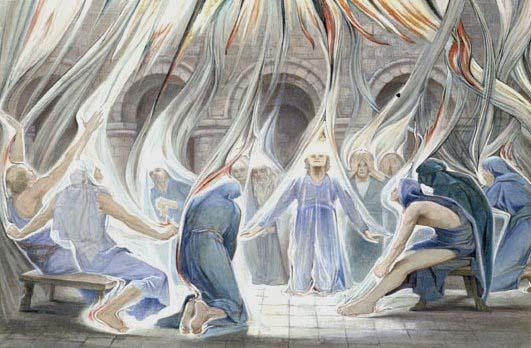 Here we see that Philip baptized the Samaritans in water but they did not receive the Spirit. Only when Peter and John went down to investigate and laid hands on the Samaritan disciples was the Spirit conferred upon them. So is there a hazy connection at best between the laying on of hands in the Old Testament and the New or is there something we’re missing? Lancaster painted a picture of the interconnectedness of a Master and a disciple. When Moses wanted to pass on authority to the next generation, to Joshua, he laid hands upon him. It’s also believed midrashically that Moses laid hands on the seventy elders who received the Spirit (Numbers 11:16-25). Moses received the Torah from [G-d at] Sinai and gave it over to Joshua. Joshua gave it over to the Elders, the Elders to the Prophets, and the Prophets gave it over to the Men of the Great Assembly. It is believed that as Moses passed on authority to Joshua through the laying on of hands, Joshua subsequently passed on authority to the Elders through the same process, then the Elders to the Prophets, and the Prophets to the Men of the Great Assembly. Whether this literally happened or not, it was a standard belief by the time of Jesus and was the basis of the authority of the Pharisees. Jesus could accurately say that the Pharisees are seated on the chair of Moses because of this tradition. I know, the words “seated themselves” could be interpreted as Jesus stating the Pharisees seized authority they did not rightly possess, but on the other hand, but in verse 3 he continued, “therefore all that they tell you, do and observe…” indicating that their authority was legitimate. The idea is that from generation to generation, Masters always laid on hands upon their disciples to pass on their authority and teachings to the next generation, to the next generation and to the next, and so on, and so on, and so on. Lancaster believes Jesus did the same in passing on his authority and Spirit. We don’t actually see Jesus laying his hands upon his disciples in order to confer authority, but given the history from the Torah and the traditions in Judaism at that time, it seems a likely assumption. Lancaster then went on to create a chain of other verses (you can listen to the sermon for the specifics) to support his claim of authorities laying on hands of “sent out ones” to apply authority and to transfer the Spirit as Moses did with Joshua. Joshua passed on his authority to his “disciples” in a similar manner and taught them to pass on authority in a like manner to future generations. 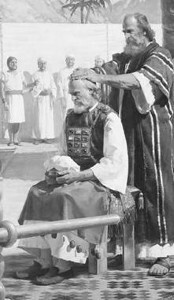 Based on all this, Lancaster believes it was a common practice, after a novice disciple in Yeshua (Jesus) repented of their sins, came to faith, received basic instructions, and was immersed in the name of the Master, that he or she next received a laying on of hands as an acknowledgement that they were a new disciple in a legal ritual that was common to Judaism. This is what Lancaster says is being referenced in Hebrews 6:1-2. Then he said the thing that Pentecostals aren’t going to like. He said that this was not the baptism of the Holy Spirit. It was a legal ritual of acknowledging a person had met the requirements for admission into the body of believers as a full-fledged disciple. It also signified the conferring of the Holy Spirit upon that person, not likely to have been accompanied by any dramatic events (Acts 2 and 10) but probably a reception of the Spirit that we see commonly in our own day. If something dramatic happened, it was written down, so most of the time, nothing was recorded. I thought it was a bit of a stretch applying the beginning of the Pirkei Avot not only backward in time but forward. It is highly unlikely that there really was an unbroken chain of discipleship and authority literally from Moses and Joshua down to the Pharisees in the late Second Temple period. However, I can see it being a traditional belief and that such a belief could have been incorporated into “boarding” new disciples into Jesus-faith. Jesus blessed the apostles and conferred authority and his Spirit (Acts 2) onto them, and they subsequently laid hands on their disciples (Acts 8, 10), and the Elders of congregations, both Jewish and Gentile, passed authority and the Spirit onto their own disciples and so on. But the chain ultimately was broken. What happened to this process? Lancaster says he is NOT saying you can only receive the Spirit through the laying on of hands. That was the process in the days of the apostles, but those days are gone. Evangelical Christianity doesn’t really like an ongoing chain of authority. I’ve heard some “not nice” things said about Catholics in the church I attend based, in part, on the existence of a Pope, and Cardinals, and Priests who form an overarching body of authority within the Catholic Church. I’ve heard it preached in the church I attend that God planned to de-centralize authority by scattering the apostles, destroying the Temple, banning the Jews from Jerusalem, so that the gospel message would be spread and authority would be diluted and reapportioned to the leaders and elders of individual, local churches (that is, removed from Jewish control and placed in the hands of Gentile Christians). 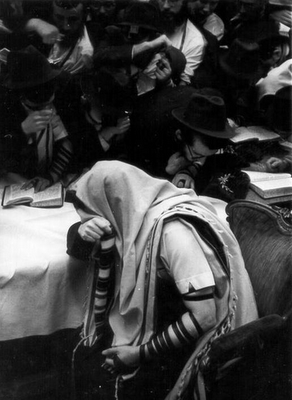 Even in modern Judaism, there are really lots and lots of different “Judaisms.” Even Orthodox Judaism does not have a central leadership, and with the death of the Rebbe (Rabbi Menachem Mendel Schneerson) in 1994, no subsequent Rebbe was appointed, though the Chabad Chassidim still focus on him and their headquarters at “770” in Crown Heights (Brooklyn) as their link back through time from one Rebbe to another. But that only applies to the Chabad. Some Judaisms and Christianities maintain a central authority and interlinking discipleship system specific to their groups, but for the most part, in modern times, each individual negotiates their own relationship with God. Every religious group has their own traditions and rituals, even Evangelical Christianity. The laying on of hands to acknowledge a new disciple in Yeshua may be one of those rituals we’ve lost over time and one that, in Lancaster’s opinion, would be good to bring back, not because it’s absolutely vital for receiving the Holy Spirit, but as a solemn ceremony welcoming a new disciple into the community. Is Lancaster correct in all of his beliefs? I don’t know. He makes a nice case for it, and I don’t doubt that the laying on of hands was one of the ancient rituals among the body of believers in apostolic times. I just believe that the chain of passing on authority was very likely broken somewhere between Moses and the Pharisees, just as it was broken after the end of the apostolic era. May Yeshua lay his scarred hands upon us and acknowledge us as his disciples, imbuing us with his Spirit, and providing us with the courage to endure until he returns.